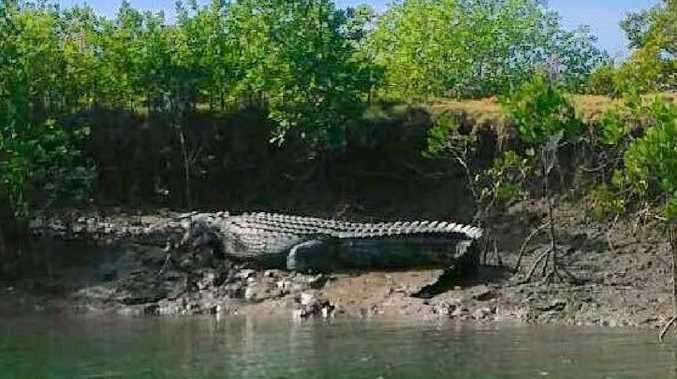 A GIANT "saltie" measuring an estimated five to six metres long has been seen lurking on the banks of Alligator Creek. The saltwater crocodile was seen near the site of the old Alligator Creek meatworks. It is unclear if the crocodile was searching for food at the former abattoir site. Jenny Roberts posted a photo of the healthy-looking reptile to social media and said her family members had saw more than six crocodiles last weekend. She said this particular croc was the biggest and estimated it to be five to six metres long. Ms Roberts confirmed the saltwater croc was not found in the Alligator Creek National Park. Local Torhild Parkinson said she was happy to see a big and healthy croc living happily in its own environment. "I guess it won't be long before it is murdered or thrown in a cage," Ms Parkinson said. The Department of Environment and science confirmed it was investigating the crocodile at Alligator Creek. The department is also monitoring a crocodile reported at Rollingstone north of Townsville on June 27. 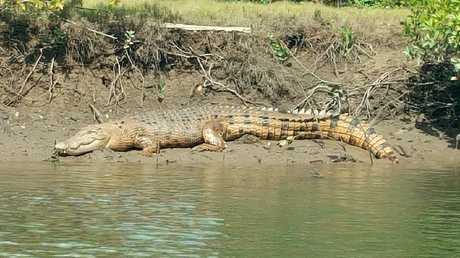 Maurita Wilson said she had spotted a large croc at Cungulla over the weekend. Croc spotted at Cungulla over the weekend. Photo: Maurita Wilson. "There was a second smaller one getting around near by that one that we saw a few times," Ms Wilson said. The aptly named Alligator and Crocodile creeks are hot spots for crocodiles. Billabong Sanctuary senior ranger Chris Benstead recently said sightings were on the increase as crocodiles took to the banks of local estuaries to sun themselves at the beginning and end of each day.